CONTENTS The BIOrescue project has developed a novel biorefinery process to convert used mushroom compost and other underutilised agricultural feedstocks into valuable bio-based materials with multiple applications in the agro-food industry and beyond. selenium, potassium, copper, vitamin D and antioxidants. pill cases and enzymes that can be used in other industrial bioprocesses. The concept will eventually be implemented at a mushroom farm in Ireland operated by Monaghan Mushrooms, one of the world’s largest mushroom producers, which will be retrofitted to become a sustainable and efficient biorefinery. But this research does not stop at mushrooms. vineyard prunings, oats and barley straw, sugar beet pulp and apple pomace. So BIOrescue could be a step towards a truly circular bioeconomy. Bioeconomy: what does it mean? economy. Bioeconomy is not a niche area. An annual turnover of two trillion euros and the employment of 22 million people1 make it one of the Union’s biggest and most important sectors. It includes agriculture, forestry, fisheries, food, biofuels, textiles, paper manufactures and bio-based chemicals used for a great variety of products. investment in the EU research and innovation programmes. â&#x20AC;&#x153;For each euro invested under Horizon 2020, ten euros of added value can be generated in the different bioeconomy sectors by 2025â&#x20AC;? WHAT DOES IT TAKE FOR THE BIOECONOMY TO THRIVE? We asked Philippe MENGAL, Executive Director of Bio-based Industries Joint Undertaking, to tell us about how public-private collaboration can foster the bioeconomy. How is BBI-JU promoting industrial cooperation, also among different sectors, to develop new bio-based value chains and products? Bio-based industries and their value chains are faced with complex and substantial technology, innovation and financial challenges – challenges which no single company, industrial sector or Member State can tackle alone. As a public-private partnership, BBI JU is instrumental in bringing together bio-based activities under one pan-European structure, pooling national and regional assets, strengths and skills. The initiative aims at connecting key sectors, creating new value chains and producing a range of innovative bio-based products, and I am happy to say that we are already delivering well beyond the 2020 targets set in our Strategic Innovation and Research Agenda. By 2020, BBI JU projects expect to create 113 new bio-based value chains and 65 new bio-based consumer products (the targets were 10 and 30 respectively). Furthermore, the structuring and mobilising effect were the two main impacts of BBI JU underlined in the interim evaluation performed by the European Commission. What are the most important benefits coming from financing projects like BIOrescue? BBI JU’s projects such as BIOrescue are developing the potential of waste as well as agricultural and forestry residues. They are perfect examples of a bioeconomy in action, meaning sustainable, resource-efficient and largely waste-free utilisation of Europe’s renewable raw materials for industrial processing. Everyone benefits from a strong European bio-based industrial sector that can significantly reduce Europe’s dependency on fossil-based products, and help Europe meet its climate change targets. Among other things, the creation of a competitive bio-based infrastructure in Europe will help primary producers (farmers), boost employment as well as support regional development, especially in rural areas. What are the next steps for the European Union to support a ‘circular bioeconomy’? In October 2018 the European Commission adopted the updated bioeconomy strategy, which aims at accelerating the deployment of a sustainable European bioeconomy. The strategy proposes concrete actions aimed at scaling up and strengthening the bio-based sectors, unlocking investments and markets, deploying local bioeconomies across Europe, and understanding the ecological boundaries of the bioeconomy. Key actions in the updated strategy include facilitating the development of new sustainable biorefineries and intensifying the mobilisation of public and private stakeholders, areas in which the BBI JU plays a key role. The Bio-based Industries Joint Undertaking (BBI JU) is a public-private partnership aiming at increasing investment in the development of a sustainable bio-based industry sector in Europe. The mission of this EU body is to implement, under Horizon 2020 rules, the Strategic Innovation and Research Agenda developed by the industry and validated by the European Commission. Back in 2014, Monaghan Mushrooms, one of the worldâ&#x20AC;&#x2122;s largest mushroom production companies, opened a dedicated research division, Monaghan Biosciences â&#x20AC;&#x201C; to exploit the power of enzymes to extract high-value products from biomass. 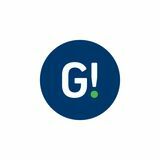 Since then, the start-up has launched several research initiatives, including BIOrescue, one of their first international collaboration projects. Darragh Gaffney, Research and Development Manager at Monaghan Biosciences, outlines what the project brings to the mushroom industry. mushroom compost on lands, this situation creates a significant economic problem but also an opportunity for our industry. New circular bioeconomy processes, such as the ones developed within the BIOrescue project, would enable us not only to avoid these costs, but also to create new value from what was previously considered as waste. our mushrooms are delivered in fuel-efficient lorries, powered with renewable fuels. in high quality, sustainably produced food and drink. project, is to reduce our waste to landfill by 20% by 2019.
processes (p. 14) that are carried out in parallel. An organosolv pretreatment is used to obtain the maximum amount of lignin, while sugars are retrieved through thermochemical pretreatment. To solubilise the sugars obtained, an enzymatic hydrolysis is applied using tailor-made and improved enzymatic solutions (p. 16). The sugars are then fermented to produce sustainable and low cost biopesticides (p. 19), as well as new enzymes (p. 18) to be employed in other biomass conversion processes. On the side of the lignin, the fractions obtained from the organosolv and thermochemical pretreatment are mixed and submitted to a chemical conversion process to transform lignin into polymers. The polymer membranes are used for the development of biodegradable nanocapsules (p. 17), which are then loaded with the biopesticides produced within BIOrescue. data on a wide range of feedstocks is still missing. sample, and costing hundreds of euros. for less than a hundred euros per sample. skin, thus raising their temperature. compost and other agricultural residues. This method will facilitate the possibility to explore the employment of new types of underutilised biomass, and can therefore foster the development of new and innovative bio-based processes. depending on the type of molecule. The reaction of these molecules is observable and recognisable. In fact, the frequency of this light signal emitted differs according to the type of molecules, which allows scientists to identify which molecules are present in a material by analysing these parameters with a spectroscope. The data collected is then interpreted through tailor-made algorithms, which make the link to the type of molecules and the amount present in the sample. B. Parallel process for optimised biomass pretreatment To recover the vast majority of the valuable components contained in mushroom compost and other agricultural waste, the National Renewable Energy Centre of Spain (CENER) has developed two parallel pretreatment processes, one being oriented towards sugars extraction and the other at lignin valorisation. THERMOCHEMICAL PRETREATMENT FOR SUGARS On one hand, a mixture of mushroom compost and other underutilised feedstocks, such as wheat straw, is submitted to a thermochemical pretreatment to solubilise the sugars contained in these raw materials. During this operation, the biomass is heated with an acid catalyst and water for an average of fifteen minutes. The sugars isolated through this process are then broken down into monosugars through an enzymatic hydrolysis process and fermented for the production of new enzymes and biopesticides. 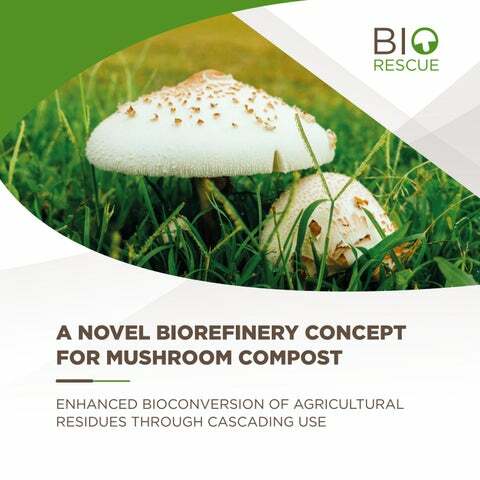 In addition to addressing the sugars, BIOrescue is increasing the value of mushroom compost through the valorisation of lignin, the “gold dust” in biomass. present in the biomass into smaller pieces. sugars from the mushroom compost in an optimal way. This makes the hydrolysis process less efficient. But BIOrescue has some answers to this challenge. utilised its innovative enzymatic lignin fractionation technology (MetZyme® PURECO™) to produce highly reactive depolymerised lignin in a very sustainable and efficient manner. This technology has the benefits of avoiding the use of heavy metals or toxic solvents, and operating in mild process conditions (temperature below 60°C) to effectively break down and at the same time preserve the beneficial properties of lignin. MetZyme® SUNO™ cocktail tailored for mushroom compost has already reduced the time and resources needed for the hydrolysis by at least 20%, thus improving the overall competitiveness of mushroom compost conversion. Partners are also using cross-linking and immobilisation processes to improve the ability of enzymatic components to resist higher temperatures and lower the dosage of enzymes needed in biorefineries. This will facilitate their storage, reduce logistical and operational costs and increase the efficiency of the conversion. Because industrial scale lignocellulose hydrolysis requires a huge amount of enzymes, this has an adverse effect on the competitiveness of biochemicals. To solve this the University of Naples introduced DNA modifications to obtain 30,000 variations of the cellulase enzyme. They screened and tested all the modified enzymes to finally select the best performing ones. This can increase the extraction yield of sugars, improving the conversion process and significantly reducing the cost. Example of the “Hedgehog” fraction from MetGen’s lignin valorisation process. This particular fraction and its modifications could be a match for applications such as foams and composites (e.g. furniture, construction material, car tires). 1. New enzyme cocktails for a more efficient biorefinery process Enzymes have multiple applications in the bio-based industries, as they can be used to produce bio-based polymers and materials for any kind of product (from yoga mats to loud speakers), as well as for paints, biochemicals, cosmetics, bioplastics and biofuels. The novel tailor-made enzyme cocktails and the genetically enhanced enzymes created in BIOrescue show a clear improvement in the conversion of lignocellulosic biomass compared to generic and non-tailored enzymes currently available commercially. Enzymes are necessary in all the steps of the biorefinery process (from pre-treatment and fractionation, to organosolv and biochemical conversion) and for any kind of feedstock. Therefore, the improved performance of enzymes in BIOrescue will reduce the overall time and costs of the biomass conversion. product with very good potential on the market. biopesticides produced within the project as well as other drugs such as herbicides or fungicides. Thanks to a natural enzymatic degradation process, this product can be employed for controlled and progressive drug release and even as a potential new plant vaccine targeting specific diseases. Beyond the agricultural sector, the capsules have a myriad of other potential applications from food enhancement to pharmaceutical products. Test of nanocapsules to treat plants diseases. new technological solutions and products to achieve the transition towards a circular bioeconomy. With the new bioprocesses developed within the project, BIOrescue partners are helping to close this technology gap in the mushroom industry and beyond, turning what was previously considered as waste into added value for rural economies. increase as Member States strive to curb waste disposal. A SUSTAINABLE AND REPLICABLE CONCEPT The potential of BIOrescue goes far beyond mushrooms. Its biorefinery system is very flexible and can be replicated not only in other mushroom farms but also with other agricultural by-products. In fact, the full title of the project is â&#x20AC;&#x153;Enhanced bioconversion of agricultural residues through cascading useâ&#x20AC;?. feedstocks such as cereal straw, hops and sugar beet residues, apple pomace, citrus peels and olive tree prunings. They found out that wheat straw, oat straw and barley straw combine most efficiently with used mushroom compost. Finally, they assessed the availability of these feedstocks during the entire year in different regions, which is a key element towards the development of local biorefinery processes. The BIOrescue concept could therefore be expanded to other agricultural sectors after the project and lead to the development of new bio-based alternatives for all the fossil-based products existing on the market. WHO MADE IT HAPPEN: BIORESCUE PARTNERS The BIOrescue consortium is a multidisciplinary team bringing together industrial players and research centres from seven different European countries, co-ordinated by the National Renewable Energy Centre of Spain (CENER) with the support of Monaghan Mushrooms as technical co-ordinator. Together, the project partners optimised the processes and technologies available for biomass conversion while adapting them to the transformation of mushroom compost. programme, under Grant Agreement N°720708. The views expressed in this booklet are those of the consortium and cannot be attributed in any way to the European Commission. All material featured in this booklet is free to use for educational purposes, but may not be sold or distributed for commercial gain. The BIOrescue project has received funding from the Bio-Based Industries Joint Undertaking under the European Union’s Horizon 2020 research and innovation programme, under Grant Agreement N°720708.